STOP! 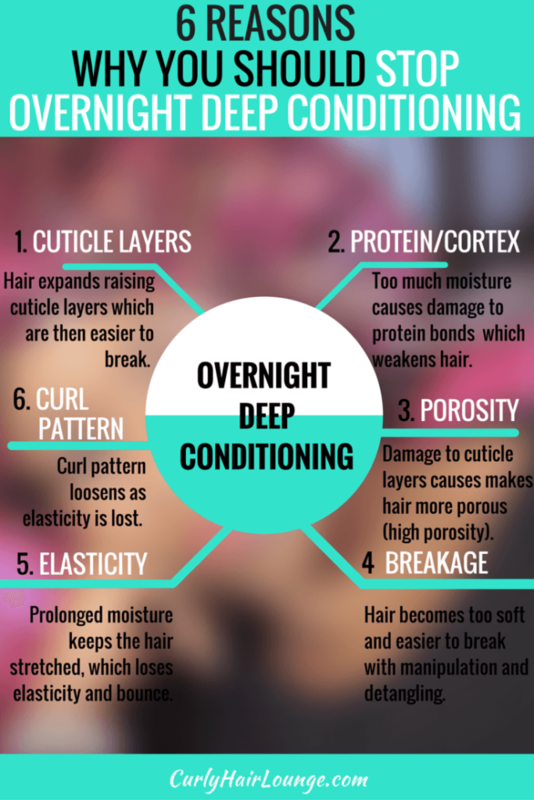 Overnight Deep Conditioning Is Damaging Your Hair! Deep conditioning your hair should be a weekly practice in every transitioners’ journey. Eck! It should be a weekly practice in everyone’s hair regimen. We all know the benefits our hair derives from it, and consequently us, when we see it shiny, bouncy, strong, elastic and growing. But this only happens if you don’t engage in practices that delay or destroy such benefits as is the use of heat or hair dye. However, there are other practices that can put a hamper on your healthy hair goals. This is the case if you do overnight deep conditioning. It is damaging your hair! Overnight deep conditioning is damaging your hair and you should stop doing it! If this is something you normally do you, read this article and know why you need to stop this. If this is not you, then get informed and alert you cousin, your BFF or your natural sista. Psst…In the meantime, if keeping hair moisture is your problem I got a super awesome email course you can take to reverse that problem. You can sign up here. Gosh, this sounds wonderful, doesn’t it? I thought so as well and wanted to try it myself despite not liking the idea of sleeping with wet hair. So, because I am a very cautious person and like to predict consequences I started digging for information that could discourage me from doing it since I already had the pros from several vloggers. Hold and behold! I found it! Why Shouldn’t You Do It? I guess that if you’re doing an overnight treatment to your hair you’re expecting to get the most benefits possible out of it. You want the ingredients in it to penetrate into your hair strand and do their best work. You believe that’s only possible if you leave it on for a long period of time, preferably a time slot that won’t interfere with your daytime routine, so doing it while catching some ZZZ sounds perfect. However, for ingredients in a product to penetrate our hair strand (be it a conditioner or deep conditioner) they have to have the right molecular structure, otherwise, they’ll just stay on the surface of the hair. Ok, so let’s assume that your particular hair treatment has all the conditions for this to happen – ingredients that can work outside and inside the hair structure. Good?! Not so good, especially because products don’t come with an indication of the molecular structure of proteins or vegetable oils. So, we don’t know if they penetrate or not. We assume they do. Additionally, a study performed on nails showed that after a 10-minute water intake they had reached their water holding capacity. At the end of the 15-minute experiment, it was observed that nails had a softer structure. In case you are wondering, this is relevant because nails are made out of keratin, a protein that is a very important component in the structure of hair. We already know from the effects of hygral fatigue, that having our hair over moisturised leads to damage in the cortex of the hair where keratin is found. Normally, the hair loses elasticity like an overly used elastic, the curl pattern loosens, hair becomes weaker, more porous (high porosity) and starts to break. Plus, according to scientist blogger from The Natural Haven, in order for a conditioner to be effective, it needs no longer than 30 minutes, and application of moderate heat reduces this time. I’ve put the case over to you, as to why deep conditioning overnight is damaging your hair and I hope you consider the evidence and rule a fair verdict. See, see what I did there…did you like my clumsy lawyer jargon? (Yeah, I watch too much Law&Order and The Good Wife!) Anyway, this has been a different post, perhaps more like a Uni paper due to my background in science and need to back up my findings. Nevertheless, I hope you can find your way in the middle of all this information and do what you think is best for you (your hair). This article is only meant to serve people as a warning. As I said before, I don’t do any overnight treatments except for my imperative oil pre-poo, which by the way, is beneficial in case you’re wondering. It helps avoid the damages mentioned before. Read this post about Pre-Poo and this one about Penetrating or Sealing Oils to find out more. I have to confess I don’t deep condition my hair for 30 minutes, I normally do it while I’m cleaning the house on a Saturday morning to maximise my time, so I do it for at least 2 hours, plus I have low porosity hair, treatments take longer to penetrate without help. Sometimes, if I’m in a hurry, I will use my hooded dryer for 10 to 15 minutes, rinse it off and style as usual. We should all aim for the 30-minute mark. What about you? Do you deep condition overnight? How does your hair feel? Have you noticed any undesirable signs? Featured Image: from MoKnowsHair on YouTube. 5 Reasons Why Deep Conditioning Is Key To Healthy Natural Hair 6 Clues Your Curly Tresses Need A Conditioning Treatment The Most 5 Reasons Why You’re Deep Conditioning Your Curly Hair The Wrong Way 5 Ways To Add Heat To Your Deep Conditioning Treatment 5 Hair Loss Conditions You Can Stop Today! This is a really informative and well-written article. Well done on a really good-looking website packed with information! …. And I think your hair is very beautiful! Hi Shivanii, thank you for your feedback on the website and for your compliment! I’m so happy you found the information here good. I’ve never conditioned my hair overnight, but I remember that my mom would put mayonnaise in my hair and have it soak for a few hours before washing it out. It always seemed to do wonders but I don’t know of anyone doing this nowadays. What would you recommend would be the best leave in conditioner? Hi Sarah! Yes, people actually do still use mayonnaise to do an hair protein deep conditioning. It is very good and it probably what your mum did to you. Ask her for the recipe, and always follow with a moisturising deep conditioner as protein tends to leave your hair feeling dry. Awesome, Awesome website. Thank you Monica for your insight and research. There are so many conflicting pieces of information out their concerning our hair that it can quite confusing. Your article on Deep Conditioning lays out the arguments with clear pros and cons but revealing the untruths that need to be heard. Thank you. I’m going to share this with my friends. Hello Dawn, I’m glad you liked the website and this article in particular. Yes, I do think there is some confusion about deep conditioning overnight. Hope this article sheds some light on the subject. When you know better, you do better Claire! Keep taking good care of your hair. Great read! One of my coworkers told me that overnight conditioning wasn’t good for my hair and this article definitely gave me a little more information on that. Thank you! Thank you, Saff! It’s great that you found the information here helful. Overnight deep conditioning can be the cause of hair damage and many times people don’t know about it and think it’s something else. Well, now you’re informed and can make better decisions. Glad I could help. I thank you for the information. I am a little confused. What is the difference between the deep conditioner and regular conditioner you use overnight? I googled a search to see if I could overnight deep condition and found this article. I also read your pre poo post. Can you give me an example of a conditioner that is ok to use overnight. I prefer anything I can do overnight since I am super busy with a newborn and 3 other LOs under 7. My hair is DRY. But I don’t have the time to wash, deep condition and then wash again sometimes during the day. I like your advice and need a little more clarification (guidnace). Thanks so much. Very appreciated. The difference between a regular conditioner and a deep conditioner is that a regular conditioner will put back the oils your shampoo takes, it will close the cuticle layers of the hair and add slip making your hair softer to the touch and easier to detangle. You can read 5 Reasons Why You Shouldn’t Skip Conditioner On Natural Hair to know more. A deep conditioner will mainly work within your hair structure providing important protein, nutrition, moisture to strengthen and give your hair elasticity. If your hair is damaged from chemical treatments you would want to add deep conditioning protein treatments to your hair regimen if it’s healthy you would do it maybe once a month or every 6 weeks, but this depends on other factors. If you want to know more about his you can read The Role Of Proteins In Hair Care and Know Your Deep Conditioners Jumpstart Your Results. I personally wouldn’t use a conditioner overnight because it can cause Hygral Fatigue and if your hair is already damaged the effects can be even worse. However, if I was forced to do it I would do a pre-poo application with a vegetable oil of my preference. For this, many people mix the conditioner with the oil and proceed by applying the concoction on the hair. I would apply a heavy hand of oil in my hair first (preferably one that penetrates the hair strand such as coconut oil or olive oil to protect from hygral fatigue) and then apply any cheap conditioner (no mixing the two). I still, wouldn’t do this every week. Here are few tips to prevent hygral fatigue if you need. I can understand that being a mother of 4 you are very busy, but I don’t understand do you use a conditioner or deep conditioner overnight? Why do you do it overnight? I know people leave deep conditioners on their heads hours on end, but in reality, after 20-30 min you can take them out. In fact, most new products only require you to leave them on for 5 minutes some even 2mn (ok, so I don’t do this! I leave them on for longer, but you can do it it still works!). If you think this is too short you can add heat to your deep conditioner and accelerate the action on your hair and the benefits in half the time. Maybe this works best for your busy mum life. As for your dry hair, the reasons can be many (products, use of heat, chemical treatments, hair practices, …), you can get get some help on building hair regimen here if you need. Browse through the articles and also check the Start Here page on the top menu bar of the website. So I mix natural oils together usually coconut oil, peppermint, and castor oil and heat it by dipping my applicator bottle in boiling oil water…then I apply it and put on a shower cap and leave it overnight… Is this ok being that I’m using natural products? I apply it on dry hair I don’t mix the oils with the water. What you’re doing is OK, you’re actually doing a pre-poo to your hair. I also apply my oil the night before my wash day and leave it overnight. This is Ok because it protects your hair from the stripping effects of cleansing your hair, it keeps your hair moisturised for longer, prevents breakage and more. Read more about pre-poo here. Does this article apply to natural homemade deep condition treatments? As long as you’re adding moisture to your hair overnight you are putting your hair at risk. Whether it is a store bought or homemade deep conditioning treatment it is conditioning your hair, making it softer, more manageable and moisturised. Doing it overnight increases your hair’s risk of damage because of excessive moisture. The only overnight treatment I like doing is a oil pre-poo. Nice article, informative and detailed. Overdoing it is always bad. Thank you for clearing it out that conditioning over night is bad for our hair. Thank you for sharing. Thank you, I’m glad to know you found the information helpful and informative that is exactly what I try to do here. If people decide to still condition overnight at least they know the risks. Hi i love this article but i have a question. What if the hair treatment has coconut oil does my hair still damage. Hi Agatha, coconut oil is a wonderful oil that can prevent protein loss, however, if deep conditioning overnight is a constant practice it will probably only delay it, not prevent it. I have to say that I DO deep condition overnight and it works just fine for MY hair and MY life, I guess what you would call decent textured black girl hair? Decent length and my hair grew WAY more and way faster when I used to deep condition OVERNIGHT once a week. The only reason I deep condition overnight now though, is because I’ve been really sick and pregnant. With very bad tachycardia and I go for 3 months at a time without even touching my hair. Wearing a scarf on a daily, with matted, tangled, sad hair underneath. TEAR. Unfortunately. But I can see what you’re saying about the danger of overnight deep conditioning. Sorry to hear you’ve not been well, especially during pregnancy. It can be really tough. My second pregnancy was tough as well. Yes, I do not recommend overnight deep conditioning for all the reasons mentioned here. The thing is this practice may “work” for some people because they have a thicker/stronger hair texture that can resist the maceration of the hair. This is similar to people who use baking soda, some will rave great results while others will have their hair completely destroyed after just one use or a couple. 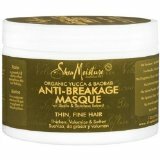 Would I want to risk losing my curls and have hair breakage? I don’t think so. Plus, the hair may be so poorly or insufficiently moisturised and so dehydrated that deep conditioning overnight will have your hair feeling soft and smooth, a real contrast from the dry hair previously held, which will keep it going and growing. I can’t actually tell you for a fact that the hair breakage you have is due to overnight deep conditioning, but in my opinion, it is something I would stop doing. I can see how it would make your hair super soft and over-moisturised and make it weaker and eventually break, but I don’t see it causing knots. This as probably more to do with manipulation, not detangling properly, not setting you hair to sleep, not doing enough protective or low maintenance hairstyles and a few other things. To help you further I would need to know more about your hair regimen. In the meantime, make sure you stop this practice. Your hair gets most of your deep conditioner benefits in a 30-minute session, but if you need more time take 1 or 2 hours. Don’t forget to also deep condition your hair for protein twice a month since you dyed your hair, monitor how your hair feels, it may need more or less, depending on your hair regimen and products, use of heat and more. You can also try a black or green tea hair rinse after you rinse off your deep conditioner. It’s really helpful. Read this post and download the guide to help you control breakage and identify potential problems. The guide will have links for further help. Does this apply only to deep condioners or should we also stop using regular conditioners like leave ins over night? What should we do as alternative? Hi Chantal, it’s basically anything you apply on your hair overnight in the same way you apply a deep conditioner for the purpose of intensifying your hair moisture. Many people know about this risk and still deep condition overnight, my opinion is that you should stop doing it whatever the product. You only need to deep condition for 30 minutes (although you can do a couple of hours). If you feel your hair is not soft/moisturised enough use heat or a steamer to intensify and speed up the process. Hello Monica, I’m very interested in pre-pooing my hair overnight. Is it ok to use a leave-in conditioner/detangler in addition to oils on my hair and leave on overnight. The reason I would like to use a leave-in because it assists with making my hair easier to comb so that I can apply the oils. What do you think? For me using a leave-in conditioner/detangler overnight on a regular basis will have the same effect has using a deep conditioner, therefore it will over moisturise your hair. If you like using and oil + leave-in conditioner mix for you pre-poo because it helps with detangling I wouldn´t do it overnight just a few moments before washing it or a couple of hours before tops. For an overnight pre-poo treatment a vegetable oil is the best thing you can use. It helps with keeping your hair moisturised, detangling and reduces breakage. You don´t need to detangle when doing this. I do an oil pre-poo and I only detangle my hair after when I apply my conditioner after shampooing it. Some people find their pre-poo helps with detangling before washing and it´s ok, however, you should be aware that your hair can be more vulnerable to breakage when it´s dry has it doesn´t have the flexibility/elasticity that water “lends” to it. Monica, I’m adding to the previous email that I sent. Note* I use the leave-in on my hair when it’s dry before I wash it. No water in hair. Yvonne, if water is the main ingredient in your leave-in then it will be the same as using a deep conditioner. Water is a moisturiser, the only reason we don’t use it alone is because it evaporates quickly, thus why we mix in oil and other ingredients. Some people constantly keep their hair wet to help it grow or to keep it moisturised, but it can have unwanted effects. Hi Monica, I love your blog btw! could you clarify something: you stated “adding moisture overnight is damaging” if so how does this compares to the greenhouse effect? Thanks for the love! 🙂 When I talk about overnight deep conditioning I am talking about having your hair saturated not lightly misted as what happens with The Greenhouse Effect. When you deep condition (overnight or not), normally your hair is wet and then you apply your product, saturating it even more. You do not do this with the Greenhouse Effect, you should lightly mist your hair with water and then cover your hair, this will create a warm environment that will moisturise your hair. Your hair is not and will/should not be wet/drenched. If you have any doubts with this moisturising method check for troubleshooting solutions here. I hope this clears up things for you Portia. Honey is an humectant, it adds moisture, makes your hair soft and is mainly made our of water, add to that the water from the blended fruits and you possibly have the same effect on your hair when living your mixture overnight. People like to deep condition overnight and many keep doing despite knowing the possible damage to the hair. If you really like doing it, please only do it as an SOS treatment for very dehydrated hair, not on a regular basis. I hope this helps Dorathy. I’ve been doing oil treatments if not every night, every other night. I just wash my little natural fro in the morning & let it air dry throughout the day. It’s only been 3 weeks so I don’t know if there’s a difference or not. I just wanted to see if my hair would grow faster after my big chop by doing the overnight heavy oil treatment. Never thought I was causing harm. Actually, overnight oil pre-poo is no bad. I do it to increase moisture retention and protect against over-stripping from cleansing. However, washing or having your hair frequently wet can also be damaging (read this). The thing is, in your case, you are at the same time protecting it with the oil-pre-poo. So, in your case, I would do it every other day and pay attention to my hair. If it showed any signs of damage I would space out those that routine. Number 1, don’t get too scared. I deep condition my hair everyday, and I have been for years, and it’s completely healthy. Although I do have to mention I use heat on it 3 times a year max, which probably makes a difference too. Number 2, and the most important thing, is that while it’s true that both hair and nails are made of keratin, nails are hard keratin and hair is soft keratin. They actually react differently, so just because your nails react a certain way in response to something done to them, does not mean hair will have the same response as the nails. Just trying to be helpful, not rude or bossy 🙂 I’m a cosmetologist/esthetician by the way. You’re not being bossy or rude at all, I love the input and discussing the topic of natural hair. You say you deep condition everyday, but you don’t mention overnight deep conditioning… so, I’m guessing you do it according to product recommendation, 30mn or even a bit more, but not overnight. Though I do Think DP everyday is too much and too much work, this will depend on your personal circumstances (hair needs, climate, lifestyle,…) and my mind is burning with questions I’d like to make you (I’m so curious/fascinated about naturally curly hair!). Nail’s keratin is certainly different from that of hair and the study’s result can’t say the reaction will be the same, but it does point to predictability, plus those you’ve done deep conditioning overnight or even for hours more than advised have noticed how much softer their hair is. Clear signs of over moisturised hair. This entails risks – raised and soft cuticle layers that can break easily making hair more porous and even hair breakage. Too much moisture and too often can lead to hygral fatigue and make hair loose elasticity…. Hair with finer hair texture will be most vulnerable to all this as will those whose hair is already damaged in some way. And then there will be those who can do almost anything to their hair and nothing happens to them. 😉 I’m sure that as a cosmetologist/esthetician you don’t take unnecessary risks. But I’m just putting the information out there and making people aware of the risks. Thank you for sharing your experience, Morgan! I didn’t know that deep conditioning overnight would damage my hair so i did it 2 days ago. Since then my curls are very loose and my hair is not the same. I don’t know what to do, i want my normal curls back. Is it going to stay like this forever? Or can i do something to make it back to normal again? Could you please give me some advice? I don’t believe deep conditioning overnight just once would damage your hair, so any differences you notice now won’t last, unless you already had some type of damage/vulnerability on your hair. In this case, what you need to do will depend on what is the cause of your ‘hair issue’. Without knowing your full routine and product use I can’t give you proper advice. You can read this post to help you. However, good universal tips are to deep condition regularly (for moisture and protein, when in doubt always go for moisture), trim ends and keep hair moisturise. Sometimes I use deep conditioner during the day because it helps my hair hold a curl better than other products I have tried. Do you have any product recommendations that will not cause damage? So you use a deep conditioner as a styler!? Interesting… Yes, you need to be careful especially when it comes to deep conditioners with protein. Too much protein causes hair breakage. The best thing to use to style your hair is to start with a leave-in conditioner or a thicker, cream-like moisturiser or a smoothie and then a maybe a product that will provide some hold. It can be a custard a gel… You will have to try a few products until you find the ones that will give you the results you want. Hi V, I consider overnight deep conditioning when your hair is wet or saturated with water or a product. The Green House Effect (GHE) only needs you to spritz your hair, so it’s not the same thing. If you just did the big chop and have no hair why do you do the GHE? For growth, moisture…? Why co-wash every day? It seems you are trying to prevent something before it happens… It’s important you get to know your hair’s needs first. The basic will always be needed (Cleanse, condition and moisturise/style), then you build knowledge of your hair, product and ingredients and develop hair care practices that cater to your hair’s needs and lifestyle. I study chemistry in college and can attest that chemical reaction that happens, when you condition your hair(deep conditioning or otherwise) has a limit. Once structure is saturated, it cannot react any further. I am not sure about organic chemistry, but basics of all chemical reactions is that they have a limit of saturation. Beyond that is supersaturation at certain conditions (such as raised temperature) are unstable and can only hold this state for a limited amount of time and start crystalizing if even small things such as scratching or in this case, brushing, would do. I have tried going over 30 minute limit and results were not as I expected. Then I had saturation in chemical reactions lecture at college. I’ve a project that I’m just now working on, and I have been at the look out for such information. I’m not sure I understand the question… Could you please clarify? I read your blog which is very informative to me, but I have heard that there are few of brands are very good for overnight deep conditioning. I never tried so not sure. Can you please advise me which is the best brand for it? Hello Liza! I am aware that there are a few brands selling products with this marketing message but I wouldn’t be able to advise you on a specific product /brand to do overnight deep conditioning. You website is amazing! I really want to incorporate overnight oil pre-pooing in my routine, but i can’t sleep with the sound of a plastic shower cap crunching all night. What do you recommend to protect me and my bedding from an oily, greasy mess the next morning?